I have been away for the week end in a beautiful barn conversion in Yorkshire. I went with four girl friends and ate too much chocolate and drank too much wine-perfect. The week end turned into something of a retreat as the weather was so bad we didn’t get out as much as we usually do. We did however visit Clitheroe which turned out to be a delightful small Yorkshire town. There was a charity shop which was heaving with people all searching the racks of clothes. I have never seen so many visitors in one shop. I squeezed to the back of the shop where Eureka! 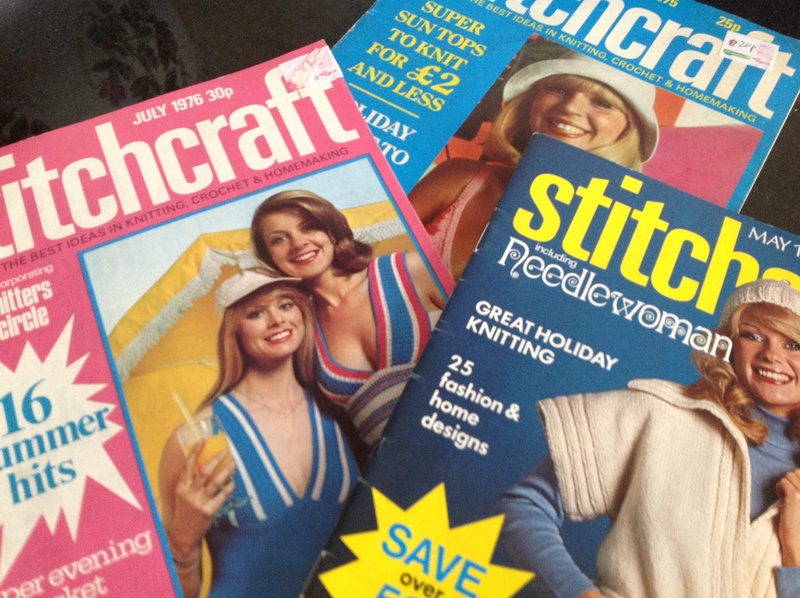 I found THREE Stitchcraft magazines To start my collection all for the grand sum of 20p each. 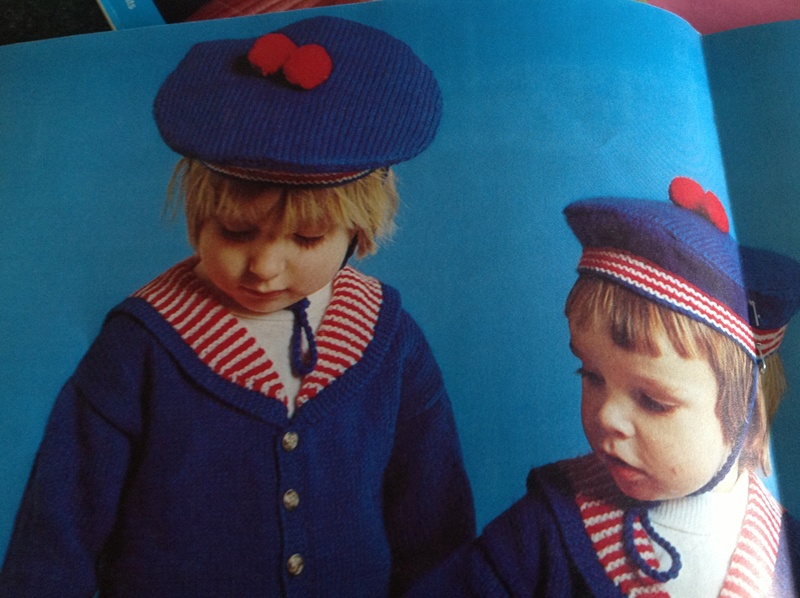 I enjoy browsing the vintage patterns and dreaming of having the time to knit many of them. 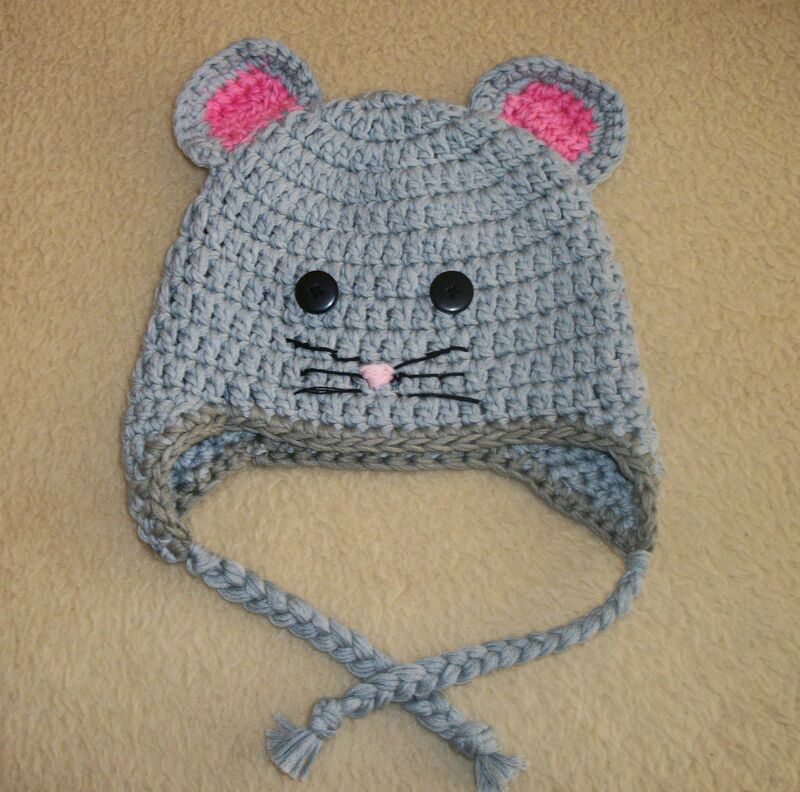 I can’t imagine my Grandchildren wearing one of these sailor hats! As we were “rained off” so much I decided to teach myself to knit on a circular needle. After considerable help from one of the other girls I managed to get going. 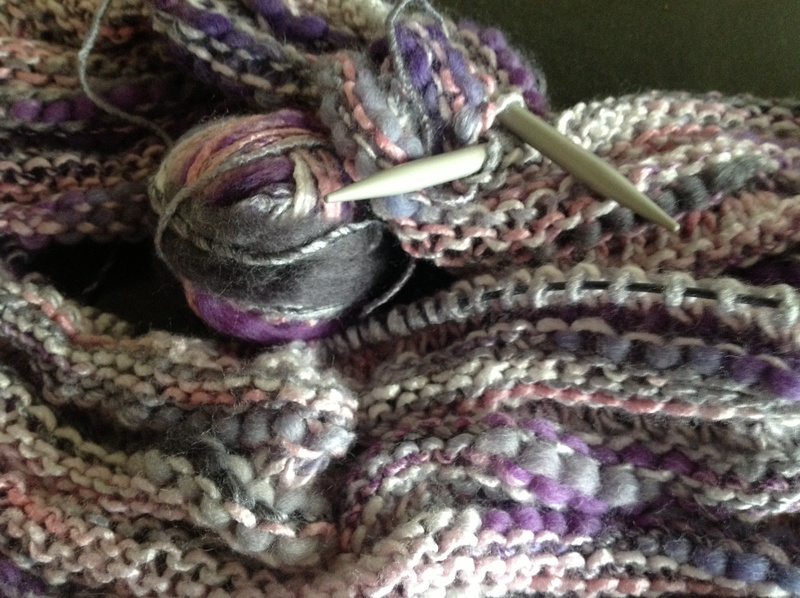 I almost finished my first cowl to snuggle in when it gets colder. I probably used too many stitches (100) but not bad for a first attempt. Despite the weather we really enjoyed our girls week end and are already planning the next. Granny squares have officially hit the Fashion Bigtime, friends. 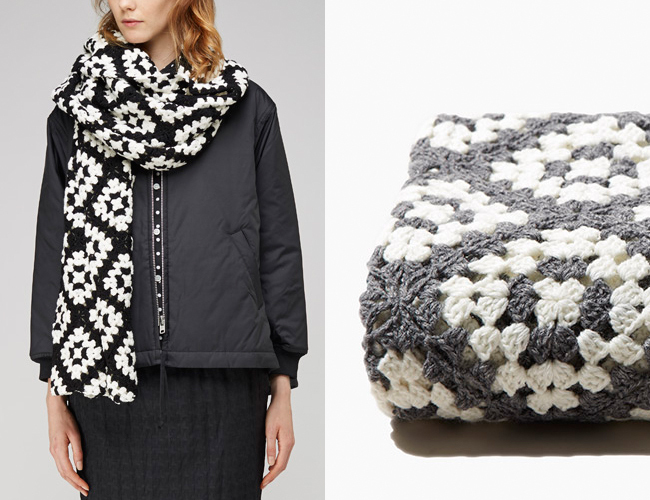 The legendary Comme des Garçons has put out a granny-square scarf, available in black/off-white and grey/off-white at La Garçonne. Of course, they don’t call it a granny-square scarf; it is a Square Crochet Stole (“crocheted … in alternating nested square pattern”). It’s granny cool, for sure, but if I ever drop $495 on a scarf, it won’t be 70% acrylic. Of course, anyone who can crochet a granny square could make themselves a 100% cashmere version for less than that — or a merino one that looks like a bargain by comparison. I have been very busy making Gingerbread today as I am away with girlfriends this week end. We take cake with us so that we can indulge in luxury afternoon tea each day. This is a Mary Berry recipe. I love “all in one” cake recipes as they are so easy. This particular one is melted and mixed in a pan before putting into the oven. The final flourish is to stir crystallised ginger into the icing before applying it to the cooled cake. Yummy! My step Grand daughter has been reading a book in class called ‘Flat Stanley”by Jeff Brown.Flat Stanley is accidentally squished when a bulletin board falls on him. Stanley is very flat but otherwise fine.Because he is flat he can travel in an envelope and goes to California for an adventure. Each pupil has made their own flat person and posted them on adventure. Flat Eden arrived this week and I have been tasked with photographing and recording her adventure with us. I have made a book of Flat Eden’s adventures and will post it back tomorrow. Job done! This picture is of Flat Eden with Benji who really wanted to chew her! This vintage pattern book arrived today to my delight. It contains patterns from bygone times but many would look very chic today or very retro. I hope that I will find time to re create one or two of the classics. Shame I can’t buy time! There are two others in the series which hopefully I will find soon. BENJI the most obedient dog ! I have returned to knitting in a much bigger way than I have for years. This is largely due to my local craft group who help and inspire my ongoing projects (of which there are lots!) 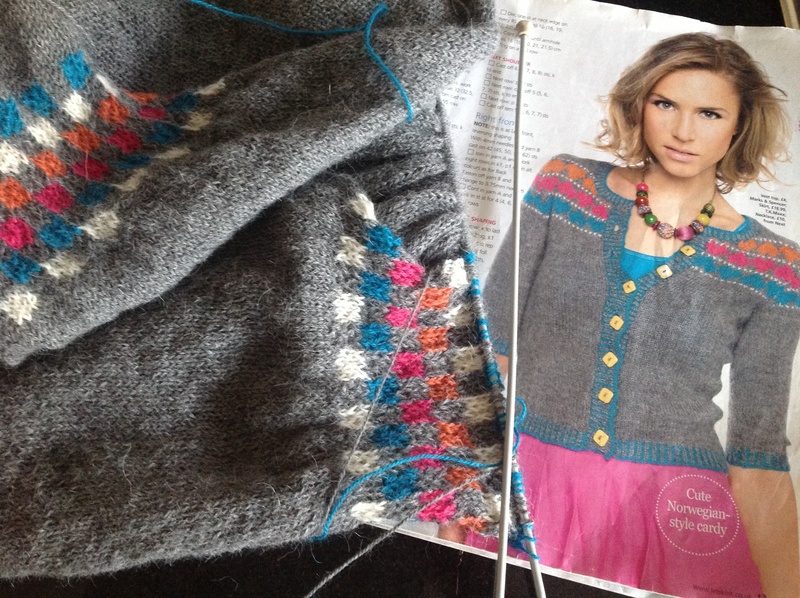 This picture is one of my current projects and is an attempt at Fair Isle which I haven’t done for years. I hope that I haven’t pulled the colours too tight, but I think that a good press before sewing up will sort it out. I am delighted with the yarn. This is 100% Alpaca and is lovely and soft. Hopefully the end product will be a success. Watch this space but maybe for quite a while. last week end we took our new dog, Benji, to an obedience dog show. Not to compete, I hasten to add,but to teach his owners a thing or two.It was a great education and the obedience trained dogs were fantastic. 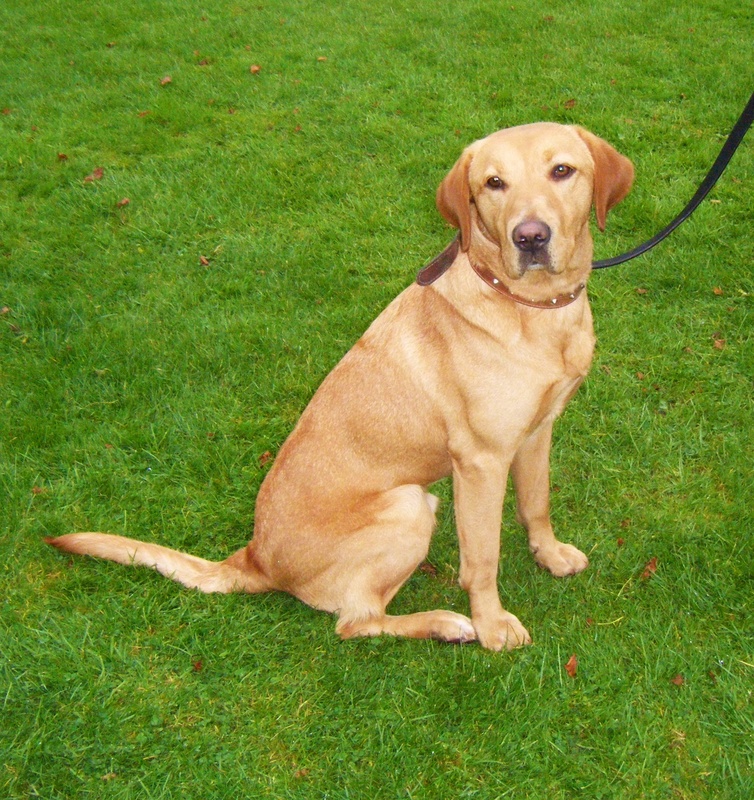 Benji is very clever so we hope to train him well. Certainly not to competitor standard but to a socially acceptable level where he walks on a lead next to us and doesn’t jump up etc. I told him to look and learn but he was very busy with a dozens of new experiences. 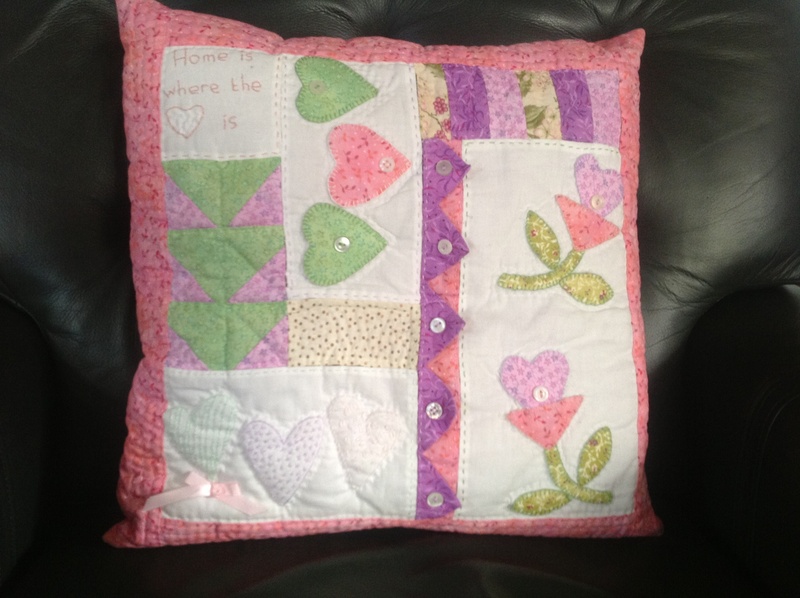 This cushion was one of my first quilting attempts. I followed a pattern in a magazine and used my own colour scheme. I actually cut it out as a kit and took it on a cruise with me. I hand sewed it all and was in the laundry every day pressing as I sewed! I finished the cushion on a second cruise a year later! I was never one to rush. 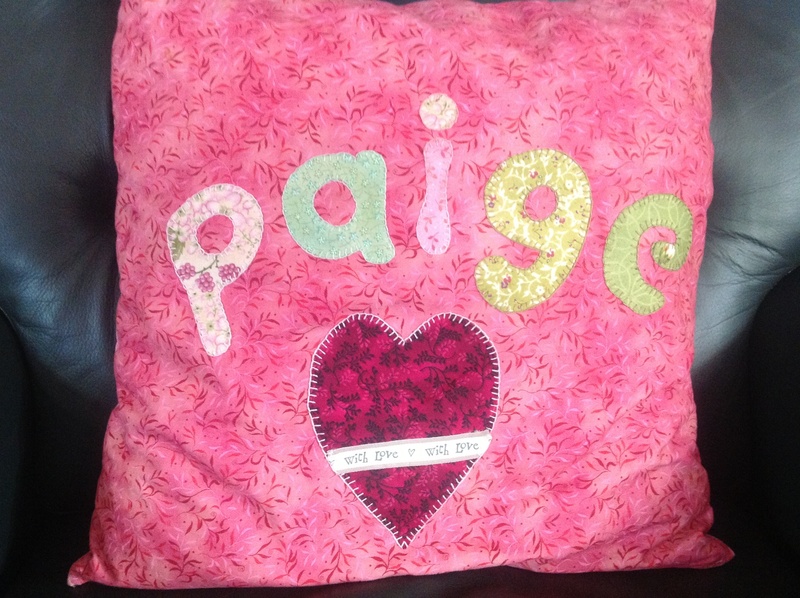 The name of my Grandaughter on the reverse was “written” using Wonder web,and blanket stitch embroidery around the letters, which was very effective. I also added buttons from my extensive button tin. Damnvan1, Husband and I visited the Yorkshire Dales for my birthday week-end. We stayed at Bolton Abbey which is a beautiful,well serviced Caravan Club site. We walked along the banks of the River Wharfe which was in full flow after heavy rain. We spent time wandering around the pretty town of Grassington, visiting a coffee shop, posting my Grand Daughters coat home and there IT happened! 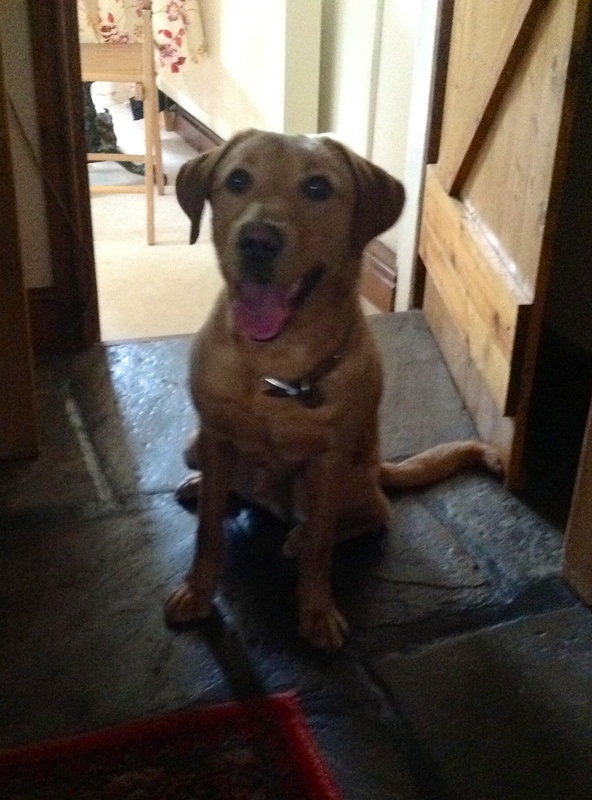 In the Post Office window was a card advertising a 12 month old Labrador for sale. Benji was his name and the description ticked all the boxes. We deliberated, discussed and finally decided. This was the dog that we had been waiting for. 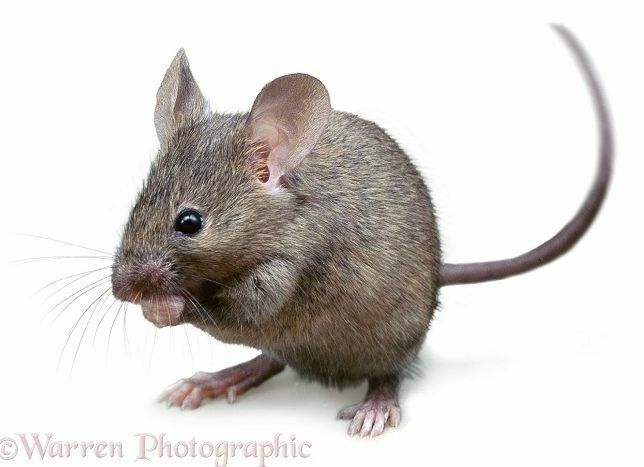 Benji is the name Bouncy is the nature. We brought him home in Damnvan1 in a dog cage for security. The week break in the Yorkshire Dales will certainly be memorable. Hopefully Benji, Damnvan1, Husband and I will have lots of adventures in the next few years. Follow this Blog to see what happens to Benji and co.